Knowledge Management (KM) Committee Members on October 14 met for the second time this year at St. Theresa International College (STIC) ’s Maria Theresa Meeting Room to further discuss the on-going KM strategy and goals which need to continuously and urgently implemented. Co-advised by STIC President, Dr. Piyada Wattanasan and Dr. Chaipat Wattanasan,Vice President for Academic Affairs, the committee members – led by Ajarn Potchana Piyapakornchai, Director of the Policy and Planning Office and the KM Committee Chairperson discussed, shared and exchanged some ideas on the KM Plan for operations this year. The members also considered and talked about development plan for Information Technology (IT) system to be applied for this knowledge management project. 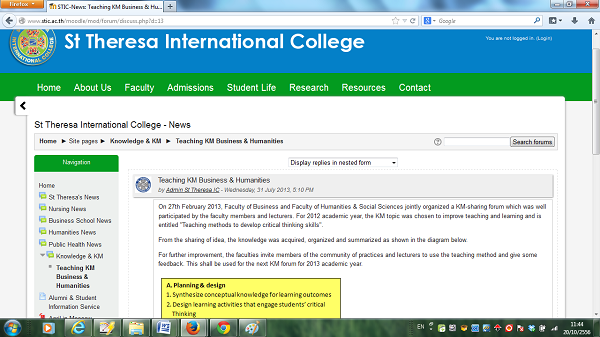 And then, The “Moodle website” was introduced as a communication channel for learning. During the past years, KM implementation project still was hindered, having obstacles /problems that delayed the working process for actual practice or application, resulting in less use, less testing, and not widely spread out. Therefore, this year’s active KM Plan is urgently needed to undertake/carry out with more captured lessons for further “Best Practice” for teaching learning methods. The members also deliberated on how to help introduce or promote the KM among teachers with the actual practice. It has been realized that KM is an important issue using more techniques for effective teaching and learning to help develop or upgrade the students or learners’ potentials. The meeting also considered the proposed KM Focus Areas and Plans which will be implemented under the College’s strategy and goals. During the latest meeting held on October 14, the members agreed that only two of all four focus areas had been selected for operations. They were Teaching, Learning and Research focus areas, while the other two focus areas such as the Educational Plan and Administration and the College’s staff and personnel development plan were cut off. The meeting was informed that the KM Committee members would not only introduce or promote the English speaking campus, but also would help push up students for the “Critical Thinking development” among them to practice more, particularly the KM Teaching Techniques and Learning project. And for the issue of Critical Thinking, this will be also applied for further development in each faculty of the College. On the August 22 meeting, the committee convened to brainstorm the plan and considered three of the four KM Focus Areas, more carefully. They were specifically, Learning and Teaching, Research, Educational Plan and Management, and Working system management for the best practice. At the meeting, participants focused mainly on the three main areas; Learning and Teaching, Research and Working System Management for the future operational plan. Additionally, the participants also discusses how to share or exchange knowledge, and various tactics and learning skills of knowledgeable people to help seek the best practice and create a new body of knowledge.